Rating: 6.4/10. From 21 votes. Summary: The description, specs, pricing, photo and user ratings for the Olympic Arms Matchmaster 5 pistol. smooth walnut grips with a laser-etched black widow icon. a full length guide rod. The parts are hand selected and fitted. You can choose a different shape trigger guard and front strap. Olympic says every pistol is test-fired with military hardball, major power factor LSWC and JHP ammunition. 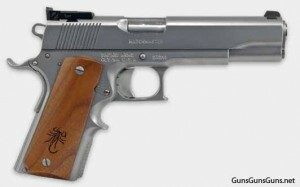 This entry was posted in .45 ACP, $751-$1,000, 1911, Full size, Olympic Arms, Semiauto on September 13, 2012 by Staff.